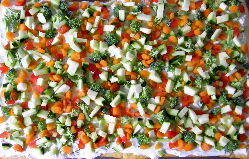 Cold Vegie Pizza is a great dish to bring to a football party or any event where you need to make your food ahead of time. It will also probably be the only vegie dish there that people devour! -chopped vegetables like cauliflower, broccoli, red pepper (any color will work), green onions, carrots, green beans, yellow or green zucchini. I don't recommend tomatoes because they get a little mushy. Preheat oven to 350 degrees. Spread crescent rolls out on a cookie sheet to make a thin pizza like crust. Bake for approximately 8 minutes or until gold brown. Allow to cool. With a mixer, beat together cream cheese, sour cream and seasonings. Spread over cooled crust. Chop up your favorite vegetables and generously sprinkle all over the top. Click here for more great appetizer recipes like Cold Vegie Pizza!